People everywhere describe their relationships with brands in a deeply personal way—we hate our banks, love our smartphones, and think the cable company is out to get us. What's actually going on in our brains when we make these judgments? Through original research, customer loyalty expert Chris Malone and top social psychologist Susan Fiske discovered that our perceptions arise from spontaneous judgments on warmth and competence, the same two factors that also determine our impressions of people. We see companies and brands the same way we automatically perceive, judge, and behave toward one another. As a result, to achieve sustained success, companies must forge genuine relationships with customers. And as customers, we have a right to expect relational accountability from the companies and brands we support. 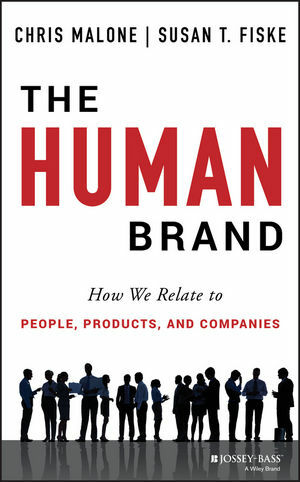 The Human Brand is essential reading for understanding how and why we make the choices we do, as well as what it takes for companies and brands to earn and keep our loyalty in the digital age. CHRIS MALONE is founder and managing partner of Fidelum Partners, a research-based consulting and professional services firm that helps clients achieve sustained business growth and performance. He was chief marketing officer at Choice Hotels International and senior vice president of marketing at ARAMARK Corporation, and has held senior marketing and sales positions at Coca-Cola Company, the National Basketball Association, and Procter & Gamble. He lives in the Philadelphia area with his wife and three sons. SUSAN T. FISKE is Eugene Higgins Professor, Psychology and Public Affairs, at Princeton University. She investigates social cognitionespecially groups' images and the emotions they createat cultural, interpersonal, and neuroscientific levels. She is author of over three hundred publications and winner of numerous scientific awards, including election to the National Academy of Science. She and her husband divide their time between Princeton and Vermont. —Ravi Saligram, president and chief executive officer, OfficeMax, Inc.
—Patrick Doyle, president and chief executive officer, Domino’s Pizza, Inc.